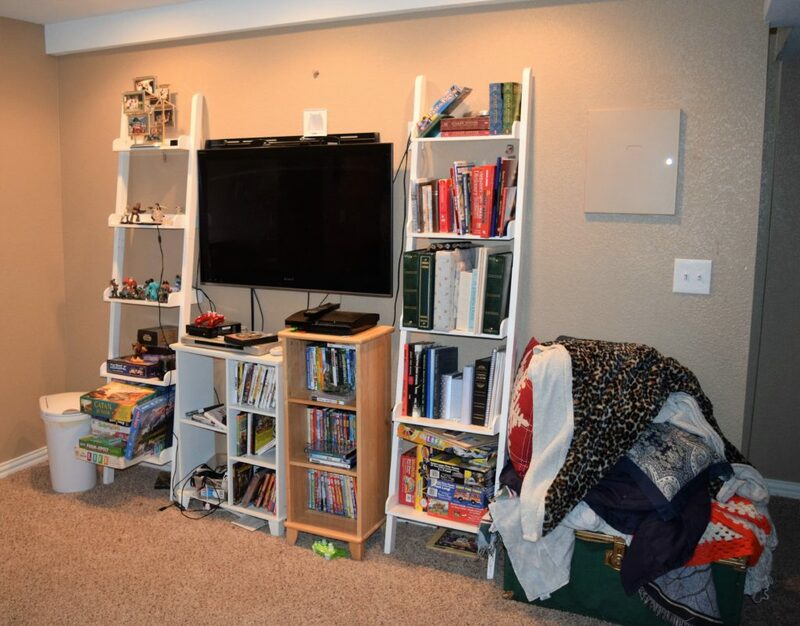 Our basement family room is the kids’ domain and therefore a neglected area of the house. However, after living with the hodgepodge of shelves below as a makeshift entertainment center, we needed something better. This wall is 11 feet of real estate that could be used much more efficiently. 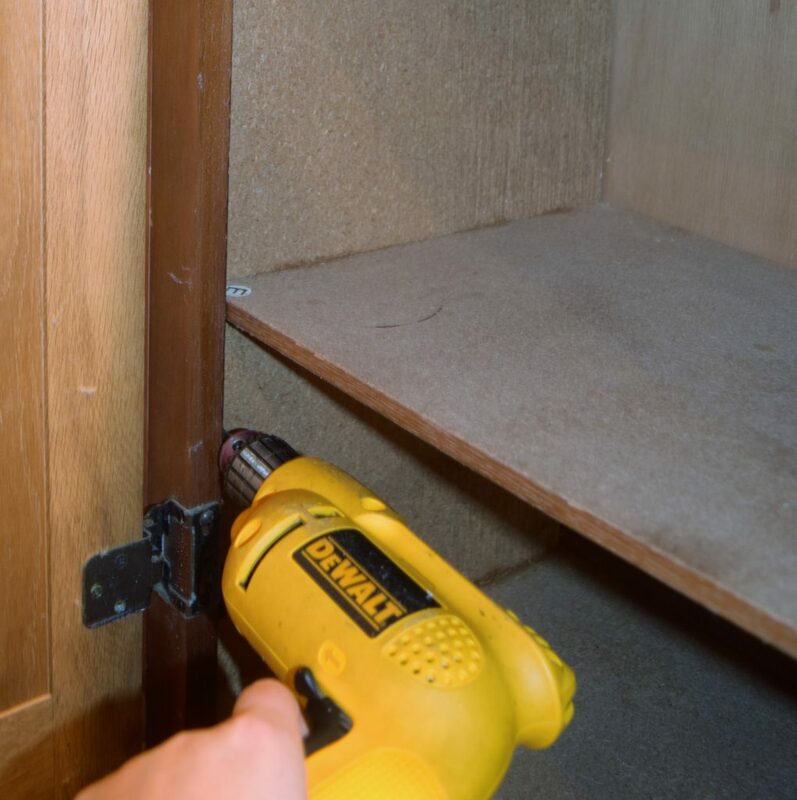 I envisioned cabinets to hide the video games, DVDs, board games and puzzles. Don’t even get me started on the hideous wall mount for the TV left behind by the previous owners. So, how to go about the transformation in an economical way? First, I went to my local Habitat for Humanity thrift shop called ReStore. 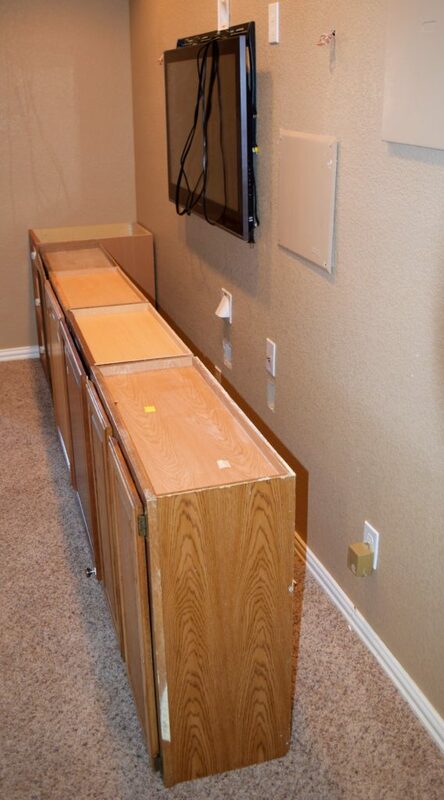 There I found kitchen cabinets which had been donated from a remodeling job. 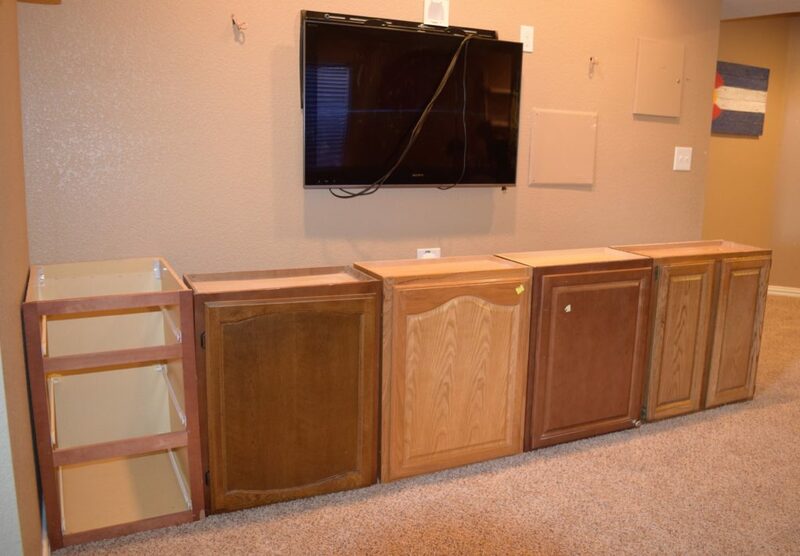 For the entire 10′ of cabinets I only spent $100. At your local hardware store that would cost a LOT more! After deciding how to arrange them, don’t forget to cut holes in the back to feed the cords through! 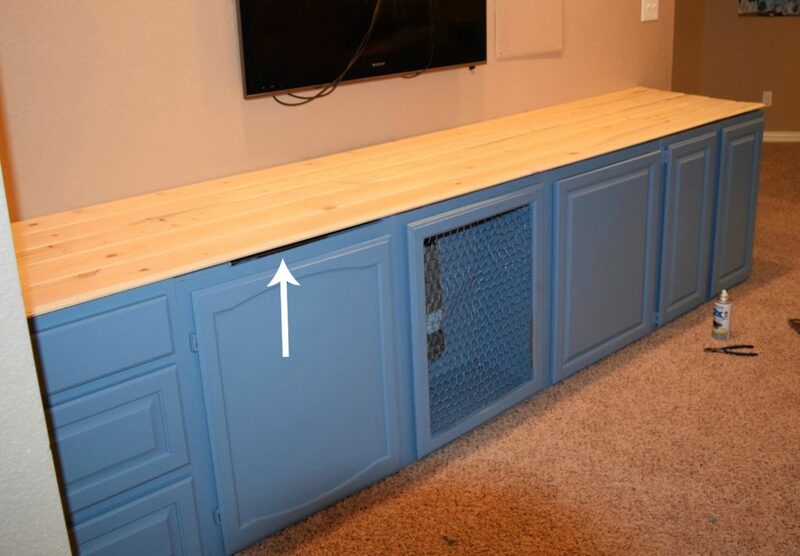 I anchored them to each other with large wood screws so the cabinets wouldn’t shift. I did not, however, attach them into the wall. In the event I want to remove and/or use them somewhere else someday (the garage?) I wanted fewer holes to repair in the wall. To incorporate the former bottom cabinets (the drawers) with the upper ones, I had to position them further away from the wall. However, having a space behind to work vs. leaning over the cabinets came in handy later! 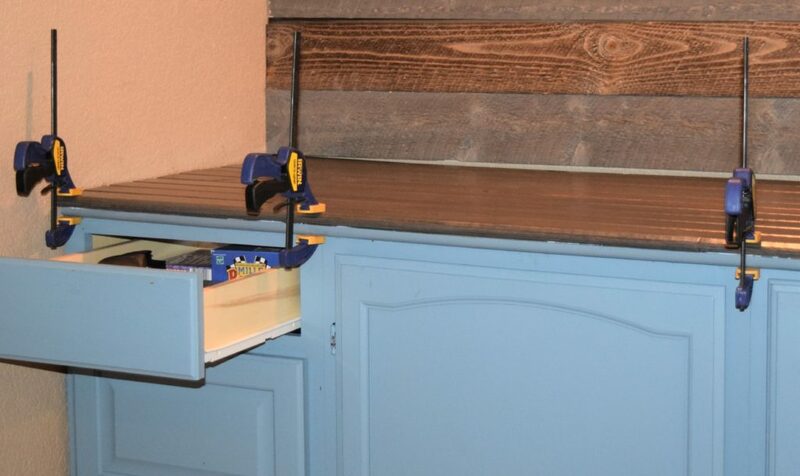 After being anchored together and holes cut for cords, I painted the cabinets to hide the fact that each was a different color. ReStore also has gallons of recycled paint at a discounted price ($20.) After the first coat, the blue looked more like a color for a little boy’s nursery. Instead of buying new paint, I found a small amount of gray paint left over in my garage and mixed it into the blue. The color turned out perfect! 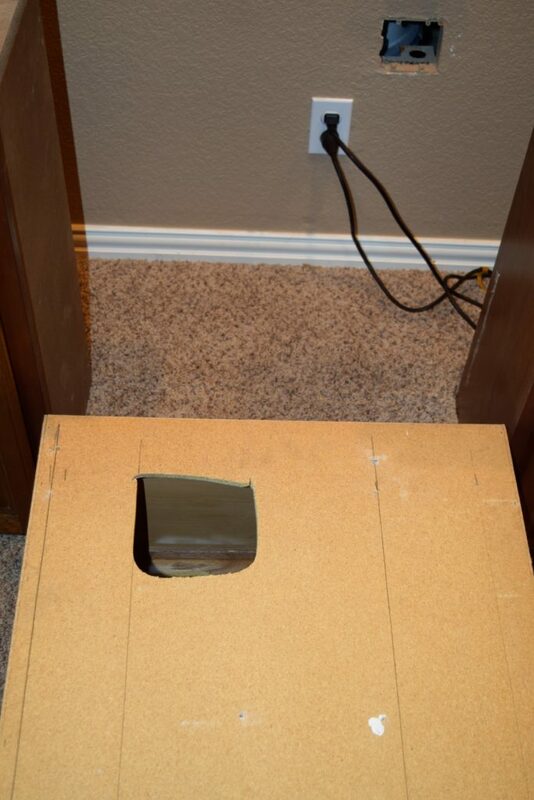 Considering the kids would be using this as their entertainment center, I needed a way for the remotes to communicate…which can’t happen through a wooden door. 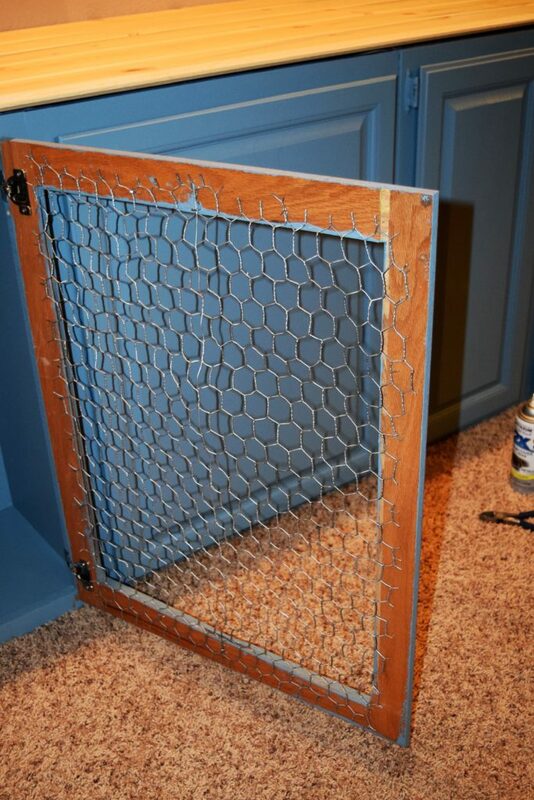 After cutting a hole in the door (and since I was going with a shabby-chic, farmhouse feel) chicken wire became the solution. I found some green wire left over from a project and spray painted it silver, then stapled it inside the door frame. The next step was preparing for the barn wood shiplap that was going above the bar. 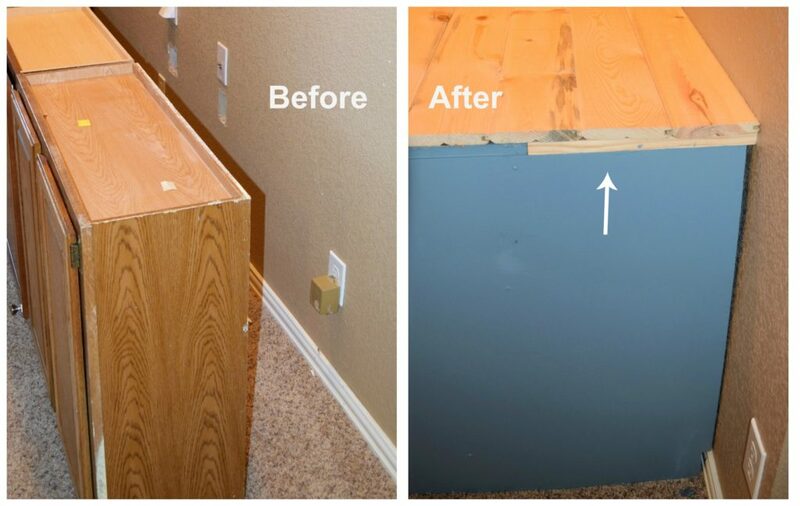 First, add 1″x 2″ boards over the studs. 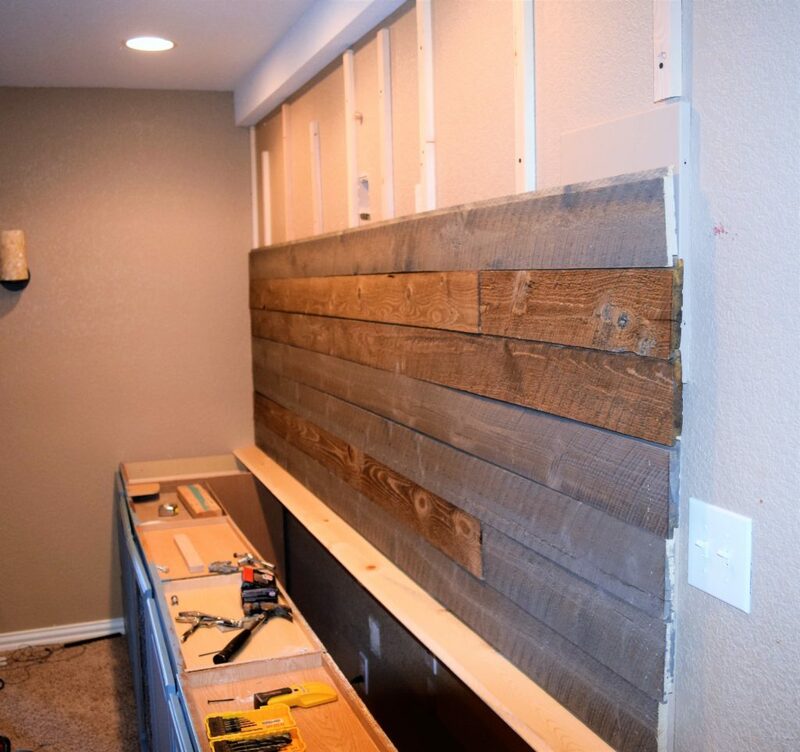 That way, no matter the length of the shiplap, you have a place to anchor/nail the boards. If need to cover something deeper than my utility boxes below, you may want to use bigger boards on the studs. The space behind was still wide enough that we can feed TV and component cords through in the future. I had originally planned to save money by recycling pallets for the wall, but after another project I decided that pallet wood is too difficult to work with. The amount of cuts through that terribly hard wood and the amount of time to sand and stain it would be ridiculous. If you have the time and want to save the money – go for it! It definitely can be done, I just didn’t feel like devoting all the extra time. 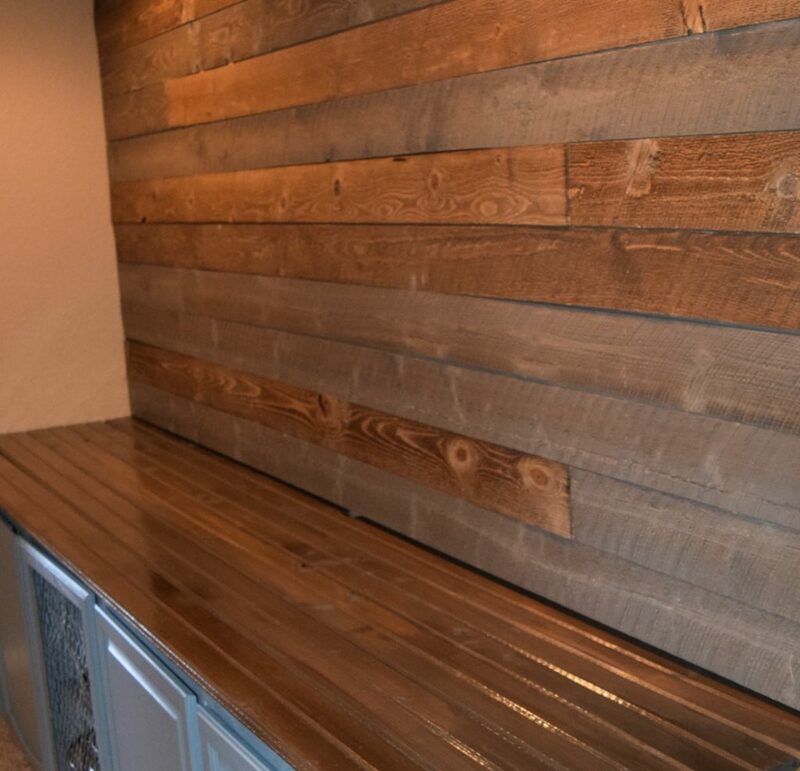 If you happen to have the extra money and want to avoid a few extra steps, Home Depot had this barn wood shiplap already stained, which cost me about $175 for the 10′ x 55″. For the countertop 10′ boards of pine tongue and groove was perfect. The five boards were about $40 total. 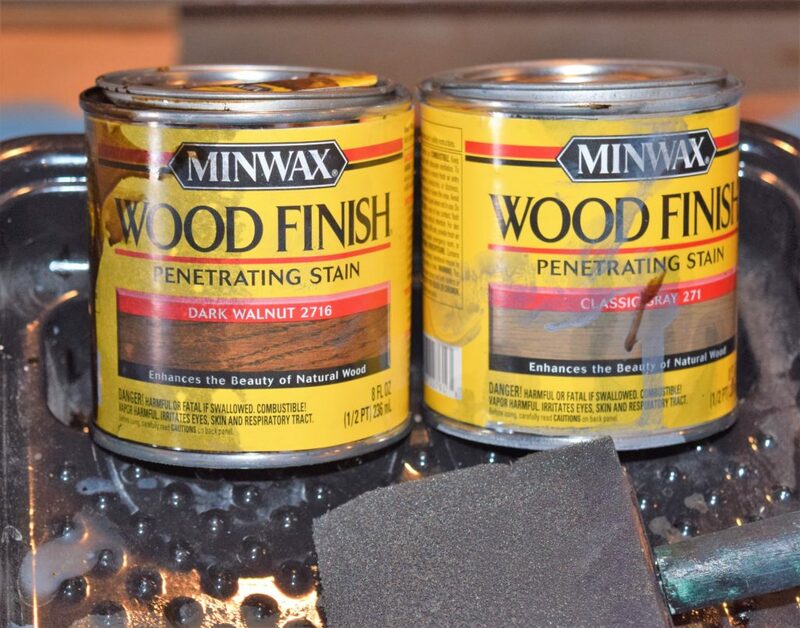 To achieve a stain color matching the boards above, I mixed a dark walnut and classic gray stain. Remember this open spot because the cabinets weren’t all the same height? To disguise that open spot and finish it off better, I painted then glued a piece of quarter-round under the countertop. FYI – clamps help immensely. In the end, we decided NOT to hang the television on the wall at the request of our kids. They like it being lower which makes it easier for their little bodies to see while sitting on the sofa. And now when all their friends are over, they have a place to set their snacks! This entire project cost less than $350 including supplies, was ten feet long and completed in one weekend. 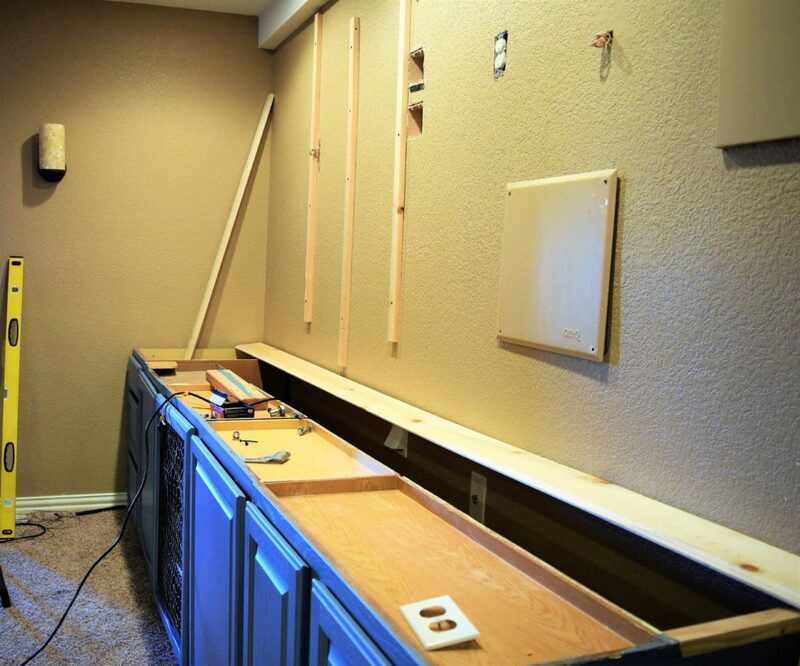 If you only wanted to make the bar with cabinets, it the cost would be even lower! ($160) All in all, this project was a fraction of the cost to hire a carpenter for a custom piece…and I get the pride of saying it was all my own idea! Good luck and share your DIY stories with me! I love hearing from you! Wow!! What an amazing job! It beautiful, so creative! That looks awesome! I’m so impressed! Thanks, Kery! Love seeing your beautiful style! This looks amazing! I will definitely have to check out Habitat For Humanity. I alway say I will, but I never remember to! No seriously since like 2006 or ’07 I’ve been saying it, but I think you have just totally inspired me!!! I know I was looking for cabinets a while back and I just couldn’t believe how expensive basic kitchen cabinets cost!!! I wish I was handy enough to do anything around my house! I love the transformation. It did look like a lot of hard work. What a beautiful transformation. 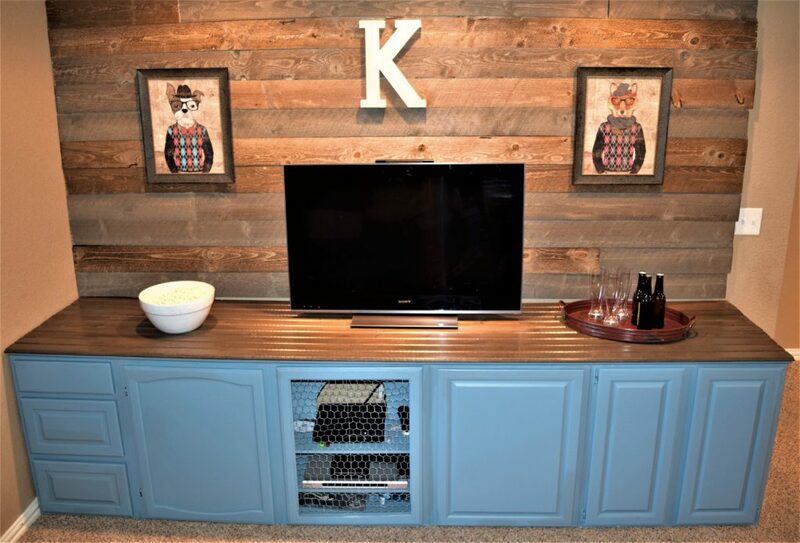 I love having things hidden and you cleaned up all that mess and cords in style! Great job and great ideas. Ingenious! That’s very impressive – well done! This is SOOOOO cool! Nice work Heather! I can see the talent here. I love the woodwork ability. They way you use all the space to get extra room on the top of the cabinets are great.